Birkenhead House can be found in South Africa’s whale watching capital: the seaside town of Hermanus. On the Southern coast of South Africa, Birkenhead is perched upon a rocky cliff, overlooking Walker Bay and the country’s most unspoiled whale sanctuary. Hermanus is only 90 kilometers away from the Cape Winelands, and only 120 kilometers from Cape Town, making it a central and memorable stop during your South African holiday. This small boutique hotel is a romantic and luxurious getaway and has become an internationally recognized traveler’s choice. It offers a pleasing fusion of classic beach house style, luxury and originality and is characterized by an easygoing ambiance. 11 Suites make up the luxury accommodation at Birkenhead, and all 11 suites (including the Honeymoon Suite) are spacious and offer spectacular sea views. Suites at Birkenhead House are equipped with all modern conveniences with plenty of original and quirky touches. Most of the suites have their own balcony, and one room has its own private pool. Ocean views, private balcony, beautifully decorated and calm. Perhaps it is the ocean working magic, but these rooms feel private, tempered, and away from the rest of the world. Ocean views, private balcony, and charming. Understated and refined. Slightly smaller than the deluxe option, but still a spacious room type. Mountain facing balcony, and period in the decor. Relaxed and airy room ideal for couples or a pair of travellers. Birkenhead’s restaurant fuses modern African cuisine with a range of international influences. Seafood is a specialty, and menus can be altered according to individual needs and preferences. Excellent in-house dining means that guests do not have to venture far for world-class food. 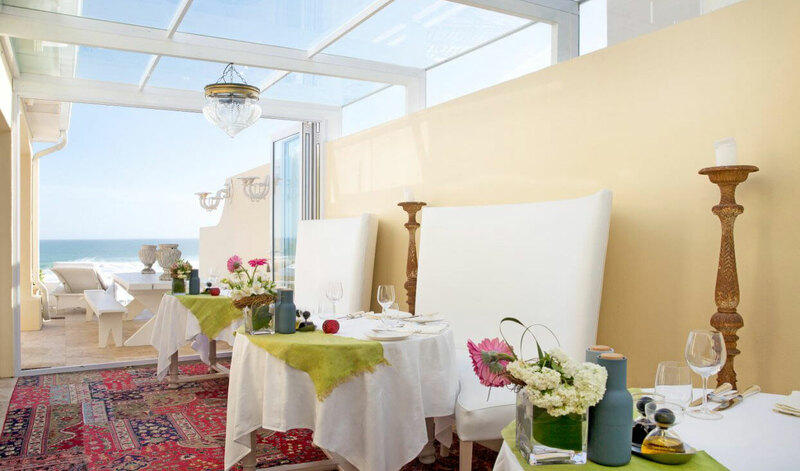 Meals are served over looking the ocean or can be enjoyed in guests’ own suites for added privacy. Birkenhead Villa is ideal for families and friends seeking a fun, child-friendly and luxurious seaside accommodation. It is a short walk from Birkenhead House, which can be visited for lunch or dinner. Birkenhead Villa sits high on the cliffs and commands incredible views of Walker Bay. Want to see Birkenhead as part of a trip? Enquire today to let us help build your holiday.